You don’t have to be an expert to build and distribute an effective online survey, but by checking your survey against tried-and-tested benchmarks, you can help ensure you’re collecting the best data possible. Thousands of books and articles have been written about survey methodology, but in case you don’t have hours to devote to becoming a guru, here are ten best practices to consider when building and distributing your survey. You’re building your survey to obtain important insights, so every question in the survey should play a direct part. It’s best to plan your survey by first identifying the data you need to collect and then writing your questions. Survey questions are such a valuable part of your surveys that we wrote a whole nother article on it here. Respondents are less likely to complete long surveys, or surveys that bounce around haphazardly from topic to topic. Therefore, make sure your survey follows a logical order and that it takes a reasonable amount of time to complete. Vague or poorly worded questions confuse respondents and make your data less useful. Strive for clear and precise language that will make your questions easy to answer. Take a closer look at questions in your survey that contain the word “and”—it can be a red flag that your question has two parts. Here’s a sample: “Which of these cell phone service providers has the best customer support and reliability?” In this case, a respondent may feel that one service is more reliable, but another has better customer support. Some descriptive words and phrases may interject some bias into your questions, or point the respondent in the direction of a particular answer. In particular, scrutinize adjectives and adverbs in your questions. If they’re not needed, take them out. In addition, an unbalanced response scale can lead a respondent in the same way a poorly worded question might. Make sure your response scales have a definitive midpoint (aim for odd numbers of possible responses) and that they cover the whole range of possible reactions to the question. Use language and terminology that your respondents will understand. Make words and sentences as simple as possible and avoid technical jargon. However, don’t oversimplify a question to the point that it will change the way the question will be interpreted. Response scales that give the direction and intensity of attitudes provide rich data. By contrast, categorical or binary response options, such as true/false or yes/no response options, generally produce less informative data. Avoid using scales that ask respondents to agree or disagree with statements, however. Some people are biased toward agreeing with statements, and this can result in invalid and unreliable data. Oftentimes respondents don’t fill in grids correctly or accurately according to their true feelings. Also, grids aren’t mobile-friendly. It’s better to separate questions with grid responses into multiple questions in your survey with regular response scales. Many yes/no questions can be reworked by including phrases such as “How much,” “How often,” or “How likely.” Make this change whenever possible and include a response scale for richer data. Ask at least five people to test your survey to help you catch and correct problems before you distribute. Ready to learn more about writing great survey questions? Download our free eBook below. 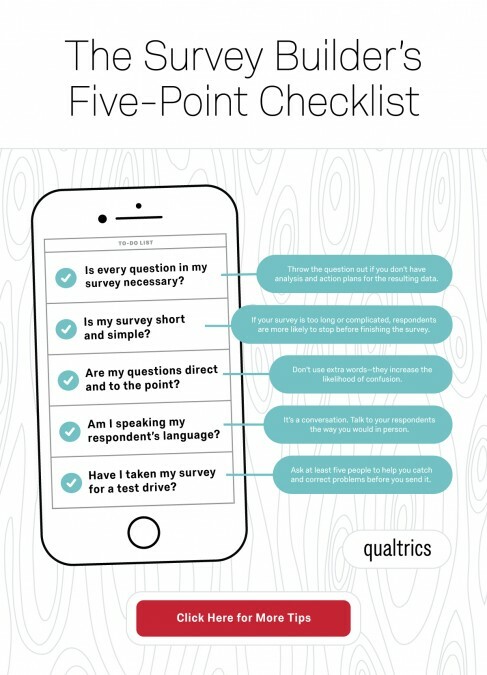 For a handy at-your-desk resource, download this infographic to be sure you’re getting the best data possible for every survey you create.